I hope the blue Ikea frames do not look cheap when I get them hung up. I couldn't help but give the frames a try after I saw all of the orange frames from a space shown in Martha Stewart last month. 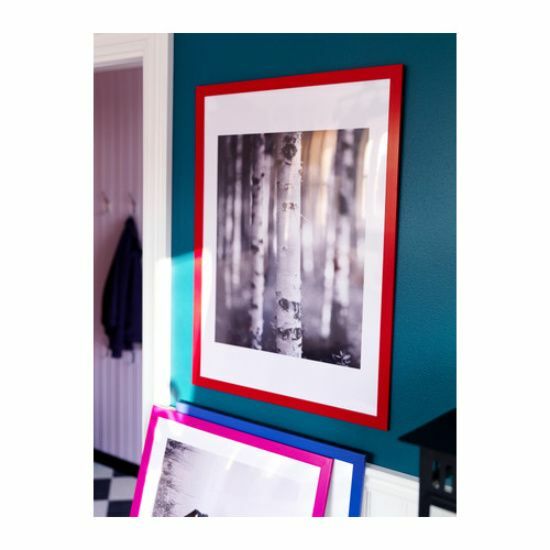 The IKEA frames honestly range in price from $1.99 to $9.99 just in case you were wondering. I love the orange frames! They pack such a visual punch. Ooh, I remember that space. Knew it looked familiar. That Greek Key on the floor is pretty cool too. Can't wait to see your art on the wall. I'm sure it will look fab. We seriously need an IKEA. That first shot...holy cow! And I can't wait to see your frames up..I've always been tempted by those IKEA brights as well! Nope. I think IKEA frames will do nicely.